It’s tempting to think of fitness resolutions as the beginning of a whole new you, but that vision alone won’t carry you very far. Old habits don’t succumb to moments of resolve, and willpower tends to be unreliable. Setting goals and thinking long-term are important, to be sure. But overreaching is setting yourself up for failure. Because even if you start strong with a new regimen of healthy eating and regular exercise, sweeping lifestyle makeovers are devilishly hard to sustain. And it’s not smart to jump into a strenuous exercise routine your body may not be ready for. That’s risking an injury that could sideline you for weeks or months. If you truly want to become more fit, embrace the Japanese principle of kaizen—the pursuit of small, continuous improvements. As a foundational first step, start building the exercise habit. Ease into it with a program of regular walking and stretching, even if it’s just a few minutes at a time. Keep at it, working up to five or six days a week, and you’ll be amazed how much better you look and feel in just a few weeks. Or maybe your goal is to build strength, improve mobility, or work on balance. No matter what your aims, you’ll be more likely to accomplish them if you start from where you are and focus on the next step, adding exercise time or intensity in small increments. That way your interim goals will be attainable and each one will pave the way for the next. Make your goals concrete and measurable. Instead of saying “I’m going to exercise more,” say “I’m going to walk 30 minutes a day, three times a week and do two strength-training sessions.” Another kind of goal might be to do one proper push-up. Start by doing one or two from a kneeling position and go from there. Harness the power of habit. Write your exercise sessions down on your calendar as appointments with yourself. Sign up for a Pilates, yoga, or circuit-training class, or make a regular date to work out with a buddy. Remember, consistency is key to any fitness program. Focus on what you can do, not what you can’t. Don’t let your body type or your physical issues hold you back. Anyone who’s mobile can still become more fit. Just keep putting your best effort toward the next small increment of progress. Keep it simple. You don’t need to glom onto the latest fitness fad or learn complicated exercises. A few basic movements and some attention to good form are all you really need. Allow for setbacks. Don’t let a bad cold or a family emergency derail you. Simply pick up where you left off, scaling back a bit if need be, and keep going. You’ll quickly make up for lost time. Make it fun. I like the energy I get from working out in a gym, but that’s not for everyone. Maybe you’d prefer the camaraderie of a group class or being active outdoors. Get adventurous and explore some new options! The more you can discover ways of moving that you enjoy, the greater your chances of reaching your goals. Making the shift to a healthier, more active lifestyle isn’t quick or easy. It requires genuine commitment and some ongoing effort. But it doesn’t have to be daunting, either—not if you take a realistic approach, one manageable step at a time. Have you noticed that we humans often gravitate to the things we’re good at, and shy away from the things we can’t do well? We get confidence from being in familiar territory, and self-esteem from our mastery of a skill or task. In the gym, that translates to sticking with the exercises we know—the ones we can knock out without any hitch or hesitation. We might even do the same routine time after time, going down a mental (or written) checklist and ticking off the boxes, in order. That’s why seasoned trainers don’t limit their routines to a standard run-through of major muscle groups. The good ones will help you systematically diagnose and work on your areas of weakness over time, gradually bringing them into balance with the stronger parts of your body. To be clear, I’m not for a minute suggesting that you push yourself to your limits at all times. 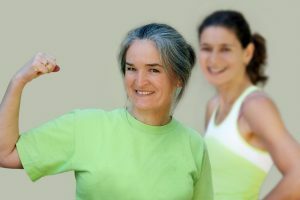 That’s asking for trouble if you’re over 50, and overtraining is counterproductive at any age. How can expand your comfort zone without overdoing it? The key is making sure you push the envelope gently, gradually, and selectively. At each workout, or every week or so, pick just one exercise you’d like to progress or one muscle group you want to strengthen. If, for example, you can’t do a full squat so your knees make a 90-degree angle, spend some time focusing on that. Then explore different ways to challenge yourself. Increasing the weight you’re lifting is only one possibility. You can add a set. Or do more repetitions in each set. Or increase your range of motion. Going from a bilateral to a unilateral exercise, such as a one-legged squat or one-armed bicep curl, can build strength rapidly. It will also immediately tell you if one side of your body is stronger than the other. In my book, improving your movement form is always the place to start. Only when you can do 15 repetitions of an exercise with good form should you think about adding weight. Mixing things up is another good way to challenge your body. Do a different shoulder exercise than the one you’re accustomed to. Or use different equipment—say, cables instead of a barbell. As a top trainer once told me, “If you want to be fit, get comfortable with being uncomfortable.” In other words, take an exercise to the point where you feel you’ve had enough…and then do one more repetition. That last bit of effort will produce rewards over time. “Whatever is worth doing at all, is worth doing well,” the aphorism tells us. I have my own version: Any exercise worth doing is worth doing completely…with a little added push at the end. The reason why gets back to the scientific principle of progressive overload. While helping soldiers rehabilitate after World War II, U.S. Army physician Dr. Thomas L. DeLorme observed that they became stronger and more functional when he gradually increased the physical demands of their training. The realization that we make physical gains by asking our bodies to do just a little bit more than they could before is the basis of resistance training. Think about what this means: your best opportunities to gain strength and endurance are right at the edge of your comfort zone, and a little beyond. If you can capitalize on this idea in your strength workouts, you will get more payoff from your efforts and advance at a faster pace. Extend each repetition through a full range of motion. That way you’ll be engaging small muscles and the tapered areas of larger muscles that might otherwise stay unchallenged. If you want a better sense of what full range feels like, start by doing one or two reps with little or no weight. Exhale with the movement, letting your breath carry you through. Be relentless about holding your form through the entire movement. For example, keep your chest held high as you do a squat or a lunge—don’t let it waver a fraction of an inch as you approach the lowest point. Your movement may not extend quite so far, but you’ll be creating more muscular tension than you would by dropping your chest to get lower. Consciously squeeze your muscles as you push or lift, and give them an extra squeeze as you complete the rep. If you can repeat an exercise 10 to 15 times with full range and excellent form, then—and only then—you may want to add a small increment of weight. Do one or two test reps to make sure you’re not straining. So keep the last 5% in mind whenever you work out. That mindset will not only boost your results, but also increase your focus—and that can only be a good thing. Set long-term goals based on an honest self-assessment. No fudging! How easy or hard it is to get through your daily tasks? Are you hampered by weakness, stiffness, shortness of breath or fear of falling? Do you suffer from chronic aches and pains? Is excess weight undermining your health or limiting your activities? Consult your doctor about any chronic health conditions, past injuries or other issues that could restrict your activities. Target areas for improvement. 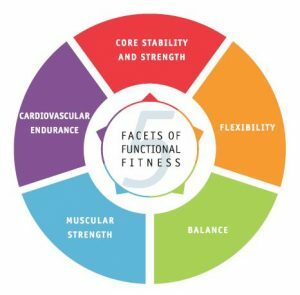 Functional fitness has five dimensions: core strength and stability, flexibility, balance, muscular strength, and cardiovascular endurance. Which ones are not being addressed by your current activities? On which aspects of functional fitness do you need the most work? As you get into your program, a skilled trainer or physical therapist can help you delve deeper into the root causes of pain, stiffness, or dysfunctional movements. Learn a few basic fitness principles. You don’t need to get on board with the latest fitness fads or know dozens of exercises. But it IS important to realize, for example, that a lack of core strength can contribute to back pain or a tendency to fall, that aches and pains may be due to tightness elsewhere in the body, and that no one kind of exercise can do it all. If you need a concise overview of fundamentals, check out Just Move!, the fitness guide I wrote for just that purpose. Know yourself. Are you a self-starter, or do you need a buddy, trainer or coach to help you stick to a workout schedule? Do you like the focus and flexibility that come from being active on your own, or do you thrive with the energy and support of a group class? Maybe you’re the competitive type who’s driven to achieve a goal, maybe not. A program created with your personality and preferences in mind will be easier to stick with. Build the fitness habit. Willpower can get you started; habit will keep you going. 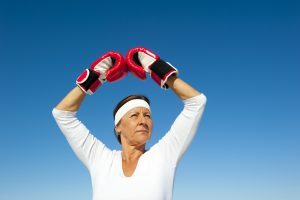 Start with regular stretching and walking on alternate days, even if it’s only 5 or 10 minutes at a time to start. Then ease into other activities. If you want to progress, consistency is key. Make it a priority. If you’re willing to give it an honest effort, you can improve your functional fitness in an hour a day, five or six days a week. Last week’s post talked about ways to address each dimension of functional fitness. Think about the combination of activities that would work best for you. Then commit to that plan. Put it on your calendar and think of each session as an appointment with yourself. Progress one small step at a time. Don’t get fixated on your long-term fitness objectives, and don’t try to make big leaps. Instead, focus on the next step, adding exercise time or intensity in small increments. That way your goals will be attainable and each one will pave the way for the next. Small changes add up to big improvements over time. 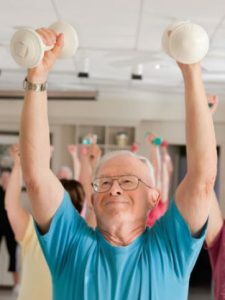 My last post discussed how functional fitness helps you put the brakes on aging. It’s a holistic approach with five dimensions. And to fight off old age effectively, you need to train for them all. So what exactly do you need to do? There’s no one “right” answer. The best fitness program is one that fits your fitness goals, is sustainable and, ideally, includes activities you might even enjoy! You can join a gym or not, exercise at home or outdoors, work out solo or in groups. It’s all up to you. What’s more, functional fitness doesn’t have to be a schedule-buster. There are plenty of ways to train in two or more dimensions at once. For example, yoga isn’t just for flexibility; depending on the style and instructor, it can also improve balance and strength. You can even target four or five dimensions at once with circuit training classes or old-fashioned calisthenics. And don’t forget opportunities to be active while doing gardening or other chores around the house. Core strength – Concentrate on whole body exercises that can be adapted to almost any fitness level: the plank, the squat, and versions of the push-up. Flexibility – Stretch regularly, if not daily, at home or in a gym. Do dynamic stretches before being active and as you feel tight. Attend yoga or Pilates classes. Use a foam roller to help loosen areas of tightness. Find opportunities to fully extend your movements as you go about your daily tasks. Balance – Work simple balance exercises into your day, like standing on one foot while you brush your teeth. Practice walking heel-to-toe with one foot directly in front of the other. Take up tai chi or yoga. Building core and lower body strength will also help reduce your risks of a serious fall. Muscular strength – Do two or three strength-training workouts a week, focusing on basic push, pull, and hip-hinge or squat exercises. For an efficient gym workout, rely on whole-body exercises using your body weight and/or free weights, rather than muscle-isolating machines. Outside the gym you can use resistance bands, free weights, or your body weight. If you’re new to strength training, see my article on how to get started. Cardiovascular endurance – Get at least 30 minutes of vigorous cardio exercise three times a week (or five weekly sessions of more moderate exercise). This need not be on cardio machines. There’s also brisk walking, swimming, biking, rowing, stairclimbing, aerobic dance – you name it, as long as it keeps you moving. In next week’s post we’ll talk about how to enhance your program’s results and set yourself up for success.